In regards to the 70 foot princess references in this thread, is there an actual link that states this is the one the WA will be using - I can't find any reference to its confirmation anywhere. Also, do we know if there will be a soft opening? And also, anyone can tell the difference between the Reef Villa vs Overwater Villas? The day before the online booking went live the website had April 30th as the opening day. A few weeks before that it had the end of May as the opening. So the opening had been moved up. The day it went live, July 1st became the opening day. So my guess, and only a guess, is there will be some sort of soft opening starting in May. 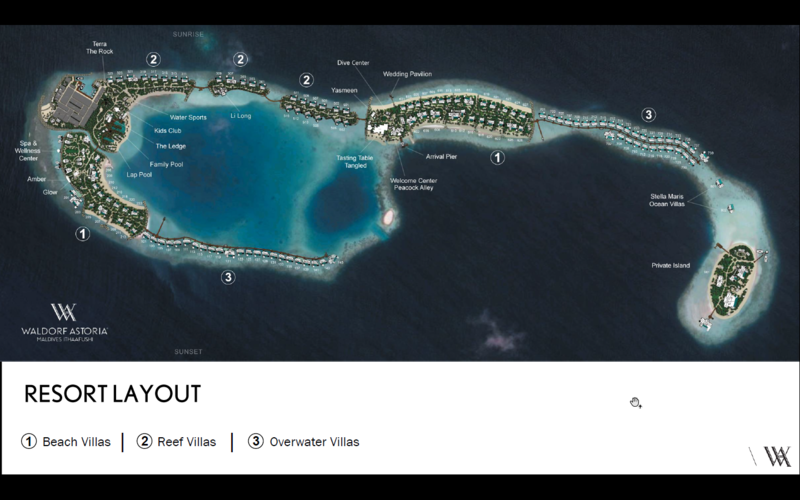 From all I have pieced together it looks like the Reef Villa is on land with the outside decking over water. The Overwater Villa is completely out in the water. The Beach Villa is obviously completly on land. But the rooms, “Standard” and Grand, looked to be almost the same. PS...the differences between “standard” and grand look to be the added living room in the grand. alanslegal, llfoster, Michael19887 and 1 others like this. Nice!! Looks awesome. The only change I would make is to also add a spa tub on the deck. 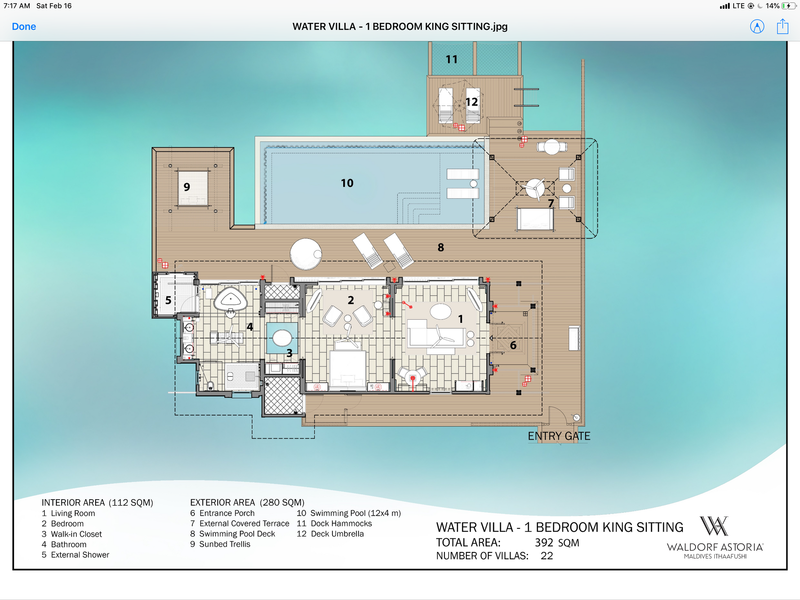 Do you have the standard water villa as well? Thanks for posting this map of the resort. Does anyone have any initial thoughts about what Beach Villas would have the best/worst location? Looks to me like the 200's and 600's are beach villas and that the 600s would be preferable, right? My question would be with the map showing the location of the BV's, would it be a better bet to choose one facing out towards the ocean rather than inwards? I would think so, unless the villas facing the other way have a more pleasant surf/reef for swimming or snorkeling. One thing I like about some of the overwater villas at Conrad Maldives is you can walk out 100+ meters from your villa and the water is still just at chest/shoulder height. Whereas with some of the beach villas there, there is a big dropoff after the walk ten meters out. Thanks for this. Curious where you found it? I do have a question re the map supplied. (I am not a travel agent and am not involved in travel except as a vacationer.) Top of map is designated sunrise and bottom designated sunset. However, on Google Earth what would be the top of this map seems (??) to be north and the bottom would be south. Trying to find out true direction of sunset/sunrise for villa selection etc. Any thoughts?? I'd say as already mentioned before, one point is the quality and "steepness" of the beach in front. And we probably have to wait until July to have the first feedbacks about that. However, the other points to consider IMO would be the sunset view and a view without vis-à-vis (601-617 odd numbers in July ////// 616-628 even numbers and probably better the 201-213 odd numbers in December). And in between, I'd have a look at shadowcalculator.eu to figure out what's ideal, nb I draw a square on the map to see the shadow appearing. That's a lot of rooms in such a small space. I hope you two are referring to another hotel because my booking says breakfast is inclusive, of which of course should be for Gold+ members. ummm... where does it say breakfast is inclusive in your reservation confirm? mine doesn't (Diamond). Just tap on "benefits" under your booking in the app, it lists a continental breakfast for 2 guests as a diamond benefit.